Texas today executed its 451st person since 1982 and the 212th person since Governor Rick Perry took office in 2000. An Indiana man whose cross-country crime spree with his girlfriend a decade ago ended in a gun battle with police in San Francisco was executed Thursday for robbing and murdering a sheriff’s officer in San Antonio. No late court appeals were filed for Joshua Maxwell, 31, condemned for gunning down Bexar County Sheriff’s Department Sgt. Rudy Lopes and stealing his truck in 2000. The 45-year-old veteran jailer was off duty at the time. The U.S. Supreme Court last week refused to review Maxwell’s case. Maxwell also was convicted of killing a man in Indiana. Maxwell, his voice breaking and choking back tears, apologized repeatedly in the seconds before lethal drugs began flowing into his arms. Nine minutes later, at 6:27 p.m. CST, he was pronounced dead, making him the fourth inmate executed this year in the nation’s busiest capital punishment state. 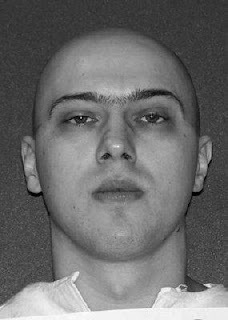 Maxwell was the fourth Texas inmate executed this year. He was among at least 10 Texas death row inmates with execution dates in the coming months, including two more later this month.